Ron Lohrman is setting up separate FIDE tournaments for Thursday nights, Friday nights and Sunday afternoons, beginning November 7th. All interest players should meet at 6pm at the Rochester Chess Center at 6pm Wednesday Nov. 6th to discuss the format, game time, etc. After the meeting, all players are welcome to play in the Community Chess Club G/80d5 rated games at 7:30pm. Click here or on the image above for the official tournament announcement. The tournament will be on Saturday November 16th. There will be $500 of catered food and more than $700 for prizes. 50% of the profits will go to the Salvation Army Adopt-A-Child and we will accepting donations of chess sets, boards, books to give to Adopt-A-Family for Christmas gifts.The tournament is organized by James Hiltunen. The Spring tournament was fantastic. Mark your calendars! This is a great tournament! 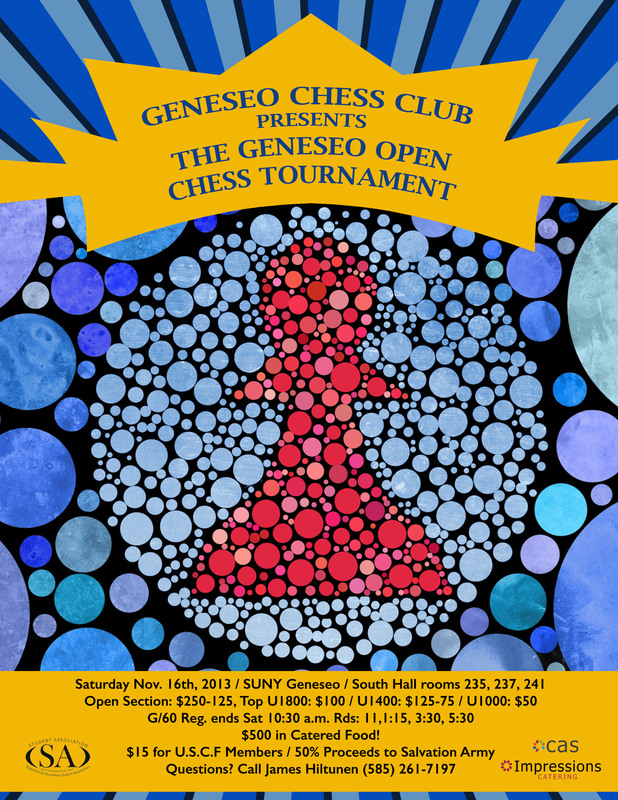 The Rochester Chess Center Saturday tournament will still be held for players unable to attend the Geneseo tournament. The Rochester Chess Center van will be taking players to the Geneseo tournament. Add your name on the signup sheet to reserve your seat. Click here or on either of the images above for the official tournament announcement.